1 - Always ensure that the LED reel is fully un-reeled before any attempt to conect it to the power supply. If you try to illuminate the LEDs while still on the reel, the LED will become hot and this will distort the copper backing plus overheat both the micro LEDs and associated IC processor. This will void warrenties of all LED suppliers. This relates to both traditional LED strips as well as Digital pixel LED tapes. Strip or tape is the same meaning, in the UK we use the word tape. 2 - Check polarity of the LED tape prior to connection to power supply, it's usually quite easy to find as a small black screen print at the cut points on the LED strip. Further information is available on each website page on this site related to each type of strip selected. You will find this under the heading PDF "technical drawing" where you will find drawing clearly marking each cut point and polaity. Never connect the LED polarity in reverse as this may cause damage to the internal IC processor on the LEDs. This is more problematic on Digital pixel tapes than on normal LED strips as they do not have ICs. 3 - Look for the arrow denoting the direction of data flow, data flow means the direction the LEDs data must flow. It works in the same way as a domino effect where the flow is a nock on type effect. The LED internal processor alway talks directly to the next LED with the data cascading along in the direction of the arrow. Normally the arrow flows away from the control module. See our data sheet for further information Do not connect the driver backwards where the flow id running towards the driver as this will not work. It sometimes can damage the first few LEDS on the strip if this happens. Cut back the LEDs until you have a working one again and disgard the damaged ones. 4 - Sissors are the best tool to be used for cutting LED strips, they are shape enough to cut evenly and leave a crisp edge on the copper PCB. This is important as frayed edges will result in connection failure. Once cut, you can solder on lead connection wires using a quality soldering iron. Invest in quality when it comes to soldering as pore quality solder will result in hard work and damaged PCB pads. 5 - Soldering the strip should be done with care and attention to detail, use glasses if you wear them as the pads are small and the legend showing the orientation of the wires are hard to read as the strip is only 10mm wide. Check the data sheet the product you are working with to give you details of the connection prior to working on the strip. Do not overheat the pads as it will delaminate from the PCB rendering it useless for connectivity. In such an event, cut back on LED and retry. it is good practice to test all LED digital strip prior to removing the backing tape an affixing it to a perminent surface. This will avoid the need to have to remove the tapefrom the stuck surface in the event of in correct connectivity to the strip. 6 - Before illuminating the pixel LED strip, check over the polarity to ensure the connections match that of the specified data sheet. Not all pixel tapes have the same wiring configurations so careful checking is avised before powering up the LEDs. When connecting to the pixel driver, check that the wiring is also correct within the plug as reversed polarity at this point will damage the LEDs. Switch on the LED driver until "Test" is displayed in the display window, at this point you should proceed to check the LEDs are all working. The driver has a "Length" setting that allows calibration for the precise number of LEDs installed. 7 - Static is an enermy of LEDs, it can be considered even worse with an LED that has an IC buil-in like the pixel LEDs known as the World Semi WS2811, WS2812, WS2812b. 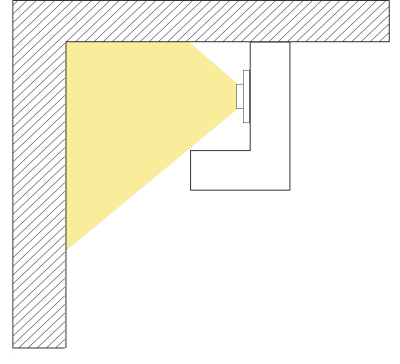 Static should be at the formost importance when installing LEDs. Static will completely destroy an LED from the inside out, often the source root of static is plastic film that is removed from plastic covers. Never remove perspex film cover when the LED is illuminated. Always switch of the power and wipe down plastic covers with anti-static spray. It isnt a case of will it damage the LEDs, its a case of wnen. Just because the damage isnt in some cases immediate, the LED will fail if it has been subjected to static. Side lighting is ideal for shelves, steps lights, raised features, curtain headers. bed back boards or any application where a feature is slightly mounted forwards of a wall. The LED strip is mounted side on to the illuminated surface to create a stunning rear facing glow that will add depth to room. Cove lighting has been very popular for decades because of the soft indirect concealed lighting look. Cove or coffer lighting as its also refered to adds an element of luxury to any environment. It creates a feeling of space. Hotels, residential, commercial and retail all use this technique. 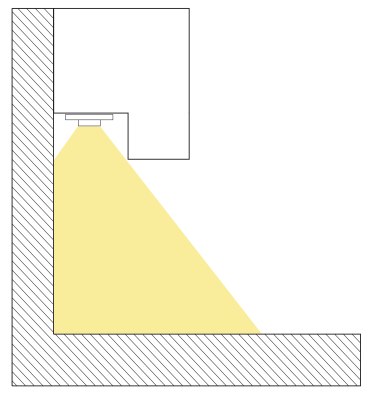 Pelmet or kick board lighting has the effect of floating on light. This style of lighting architecture is common place, its very practical and adds the wow factor to any project. White light or colour changing lighting works extremely well in this form. 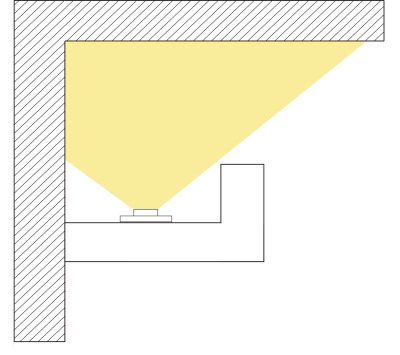 For best results, the LED strip is mounted facing downwards.